Rumor has it there’s some kind of frenzy around Porsches as investments. However, that should not be a cause of despair for those of you who are small of wallet. In fact, you can still have a horizontally opposed engine situated behind you, and a pre-1980 build date. You can even have some of that early-Porsche charm, before they started bulking up with luxury features in their evolution from pure sports car to luxury GT. And while the frenzy has been lightly tickling the values of the Porsche 914, there are still affordable cars out there. 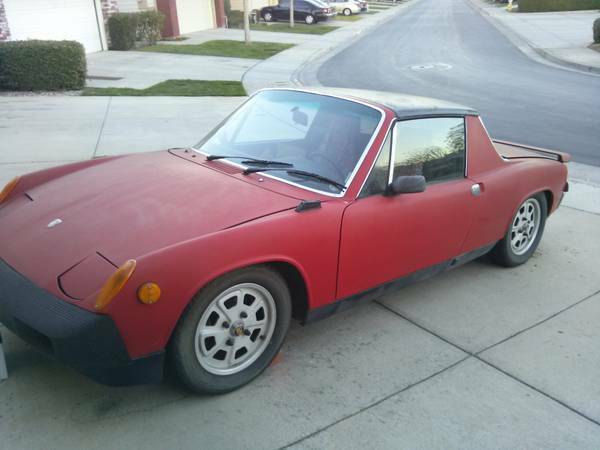 Check out this 1973 Porsche 914 2.0 for sale for $4000 in Gilroy, CA. Faded red paint is not beautiful, but it suggests the car’s been in dry climates for most of its life. The red engine cover shows it’s been repainted. As for the spoiler on the rear deck – find some rubber plugs at home depot, a couple of wine corks, or even pieces of chewing gum, and then unscrew that thing and fling it into the bushes, and plug the holes with whatever you got. The car is said to be a nearly completed project, but for time and money – isn’t that always the case? In any event, it’s got recent coil, clutch, tires, fuel pump, and fuel pressure regulator. Most of us would expect more from a nearly completed project car, so perhaps the seller has left out the engine rebuild. The 1973 914 2.0 is said by some to be the most desirable model, so if you agree, here’s a chance to get in at the bottom end. However, even 914s seem to be up in value, and a few years back this car might have had a lower asking price. Given that, you’ll want to ask some pointed questions about the late (1975) front bumper visible in this shot. Hopefully it’s just a replacement, and not a sign the whole front end of the car was swapped at some point. Often, early impact bumpers led to major structural changes, so swapping them out would not be as simple as just remove and replace. 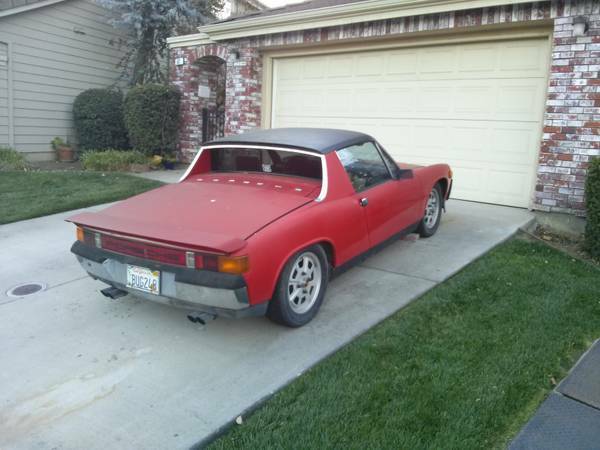 No details are given on any rust, and most 914s at least rust in the battery box. Is there enough value in this car to make it appealing? This entry was posted on April 25, 2014 at 2:11 pm and is filed under Feature. You can follow any responses to this entry through the RSS 2.0 feed. You can leave a response, or trackback from your own site.